Make the most of your time at Walt Disney World — and stretch your budget — with more than 500 vacationer-tested tips! Are you looking for tips to save money and time while still having a MAGICAL vacation at Walt Disney World? 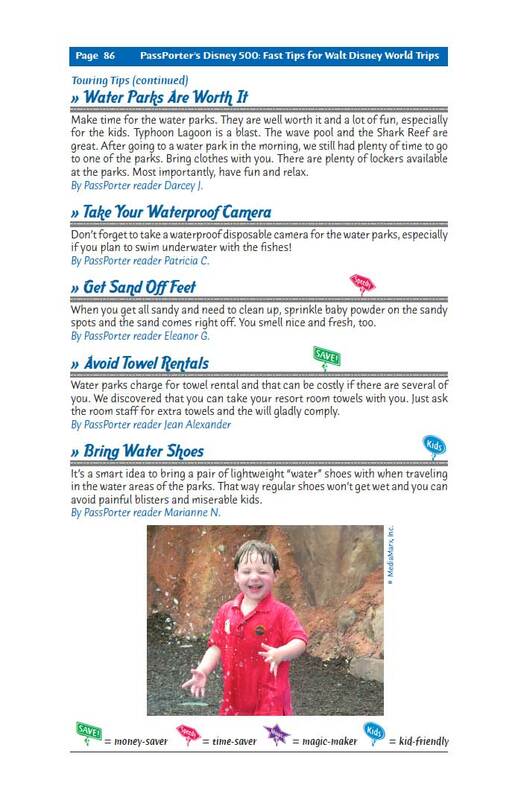 Wouldn't it be nice to get these tips without having to wade through lots of web sites, message boards, and guidebooks? You're in luck! This low-cost book is packed with more than 500 REAL tips from fellow vacationers — each tip has been hand-picked, sorted, categorized, and edited by Jennifer Marx, the bestselling author of more than 50 books, including the popular PassPorter's Walt Disney World guidebook. "I've been using these tips left and right. The tips in PassPorter's Disney 500 are all authored by the true Disney experts: fellow vacationers who've been to Walt Disney World many times. Readers submitted these tips (and many more!) to us over the course of 18 years. We've chosen the best tips that are essential to a great Disney vacation. And you can rest assured that every tip is up-to-date, accurate, and policy-abiding thanks to the extensive editing. You can trust the PassPorter name to bring you reliable advice. Updated Version! PassPorter's Disney 500 was updated in July 2016 to include the latest tips on using new technologies (like MagicBands) and to incorporate all the recent changes in general. Tips are organized by chapter -- planning, traveling, lodging, touring, dining, and making magic -- and grouped by category, providing a well-rounded collection of tips that will suit most vacationers. Even if you only use or two tips, you'll be ahead of the game! "I really like a lot of the tips. ...and much more! Click here to see the full table of contents. "Fun to read! Gets me in a Disney mood." "Good hints and tips on planning, dining, and touring the parks! " "I found so many new tips that I didn't have." Love the tags that mark money saver, magic, kids, etc. Click here to purchase your copy for only $6.95! PassPorter's Disney 500 is 127 pages, packed with helpful advice, tips, tricks, and photos. And unlike most e-books, this file is fully-formatted just like a regular print book... it will even fit into a Deluxe PassPorter Binder, if you have one. BONUS: Owners of this e-book receive a valuable 30% off discount coupon for any of PassPorter's print guidebooks! The coupon is located inside the e-book (page 55). Want to read more? Here are the first 20 pages of Disney 500 for you to preview! Keep updated! Purchase of the e-book version of PassPorter's Disney 500 allows you to login and re-download updated versions for the lifetime of the e-book!